@WinterWhite I had that same Blue Apron meal and was quite puzzled about the Grains of Paradise as they added no discernable flavor to the steak, but did add some crunch. The peanut ginger topping and lime parsley thingy were awfully good too. The only thing in that meal that didn't work well for me was the plantain, which had too much bruising and a few bad spots so it didn't really make enough for the meal. Re watermelon radishes... aren't they gorgeous? And yummy. I put them in stir fries sometimes, right at the end. And a lemongrass and ginger mojito is a beautiful thing. So is lemongrass and lavender ice cream. @Anniebets ; Our plantain had a bad patch that I had to cut away too, but it turned out for the best! It changed the ratio of butter to plantain – plus, based on recs from commenters, I added a glug of milk – so the mashed plantains were pretty creamy, and buttery/sweet. And there was just the right amount for us. Good to know I didn’t miss a whole lot with the Grains of Paradise! Do you find watermelon radishes in your local market? I've only gotten the one from BA...it looked so unpromising on the outside, but inside it was ART. We've also gotten pink lemons a couple of times now. They are to lemons what pink grapefruit is to grapefruit...kind of hard to zest because the skin has ridges, but I like them. Wow, those are beautiful, is their flavour any different. @GraziDiMenti ; Yes, they're less tart. BA has featured them as a topping for salmon or fish: supremed, and then either sort of candied (like a quick chutney), or drizzled with olive oil/salt/pepper and left to marinate for a little while. Our local chain type supermarkets don't have watermelon radishes but I believe I've seen them in our local "natural foods" market. The CSA (community supported agriculture) boxes I used to subscribe to had them when they were in season. I would hover over my email box on the day we got the notice that selections were ready to be made because those radishes got scooped up fast. It was a sad day when I wasn't able to get to the website quick enough to order them. I had my first pink lemon in the Blue Apron box with the zucchini and spinach quiche meal. The zest of the lemons went in the quiche and the juice in salad dressing. I have to say I was pretty jazzed by the taste. The quiches were amazing, the salad okay. I was so impressed by the flavor of those lemons. Just imagine lemonade made with them! I never really thought about pink lemonade actually coming from a pink lemon (found in nature) I just thought it was marketing. Not to suggest that the pink lemonade concentrate of my childhood came from beautiful heirloom pink lemons. Har har har. While picking out cheese for our Kentucky Derby party last weekend, I tried something they called Bollywood cheese. It had mango chutney in it and it was insanely delicious. It was gone within the first 30 minutes of the party and a number of people texted the next day to tell me they picked it up. It was ridiculously good. 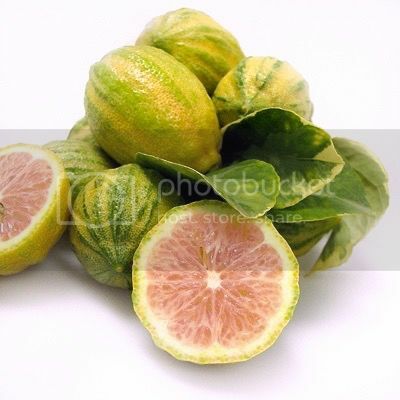 @Anniebets and @GraziDiMenti ; The two pink lemons I've gotten were both really tiny. Don't know if that's a characteristic of this variety...or if I was just unlucky, twice! @ashtangajunkie ; I often make toasted cheese sandwiches with sharp cheddar and Major Grey's mango chutney. Why didn't *I* think to market a product like that? Sounds delicious. @WinterWhite You're ahead of the curve on that cheese anyway. Also, I want that sandwich! this just increases the urgency with which my Mr. Hendryx has to open his sandwich shop. His "world's best grilled cheese" is sourdough bread, sharp cheddar and carmelized onion jam. It. Is. So. Good. Does anyone out there make a pre-mixed cheese and carmelized onion schmatta yet or are we still ahead of the market? I had to look up Grains of Paradise, found that it is a species of the ginger family, is obtained from the ground seeds, and is peppery with hints of citrus. I'll have to try to find some, sounds good!